Nokia Siemens Networks has been selected by O2 (Telefónica UK) to prepare its network to deliver 4G - Long Term Evolution (LTE*) - services across London and the South East of England. The UK operator is anticipating a rapid launch of 4G following Ofcom’s spectrum auctions scheduled for early 2013. The decision to upgrade its network to 4G was made after a successful 12 month LTE network trial involving hundreds of consumers and businesses across parts of London. O2’s investment in its UK network with Nokia Siemens Networks includes an upgrade to its existing GSM and 3G (HSPA) network with the latest radio access technology. Nokia Siemens Networks is also enabling O2’s radio access network (RAN) sharing. Under the contract, Nokia Siemens Networks is providing its Single RAN platform, and implementing its high-capacity Liquid Radio solution based on the energy-efficient Flexi Multiradio 10 Base Station . To enable consolidated configuration, monitoring, and network optimization across the networks, the contract includes Nokia Siemens Networks’ NetAct network management system. To ensure a high quality 2G and 3G network modernization as well as a smooth LTE rollout, the agreement also includes network implementation and care services across 50 percent of O2’s radio access network including the South-East of the UK and London. Supports LTE-FDD DL/UL 100/50Mbps, UMTS-HSPA+: DL/UL 42/5.76Mbps and GPRS/GSM downward compatibility. 29 November 2012, Shenzhen, China – ZTE Corporation (“ZTE”) (H share stock code: 0763.HK / A share stock code: 000063.SZ), a publicly-listed global provider of telecommunications equipment, network solutions and mobile devices, has announced the launch of the ZTE MF823, the world’s smallest 4G LTE datacard. With driver-free capabilities, the MF823 offers consumers fast and easy internet connectivity. It uses Qualcomm’s second generation LTE chip platform and is only 13mm thick, nearly a third of the size of the first generation LTEdatacard, making it the world's smallest LTE datacard. The MF823 has a web UI operation, supports IPV6 and is compatible with Win8/XP/Mac and all major operating systems. It supports LTE-FDD DL/UL 100/50Mbps, UMTS-HSPA+: DL/UL 42/5.76Mbps and GPRS/GSM downward compatibility allowing consumers to enjoy high speed internet access wherever they are without the need for a fixed line internet connect or public WiFi hotspot. The average power consumption of the MF823 has also been greatly reduced compared to the consumption of the first generation LTE datacard; it uses a third less power. It has improved radiating properties and with the lowest working temperature in the industry it will not feel hot even after long time use. The MF823 has been optimised in terms of high bandwidth, low delay and high communication rate (to reduce the dropping rate of data and voice communication), to ensure that users can enjoy a new generation of mobile high bandwidth internet access. The ZTE MF823 has already been launched in Kazakhstan and will launch soon in Europe and Asia-Pacific countries. Since 2008 ZTE has focused R&D and investment on LTE terminal products and has already obtained a number of LTE terminal core technology patents. 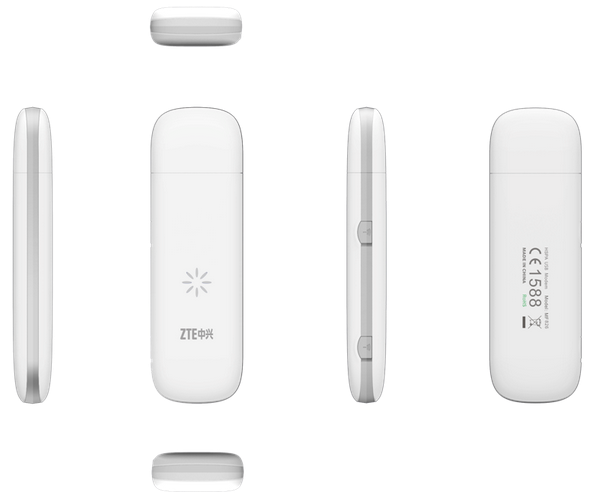 Earlier this year ZTE launched the world’s first multi-standard USB modem, the MF820S2, and uFi, the MF91S. ZTE was also the first China mainland vendor to launch a 4G LTE smartphone, the Grand X LTE (T82). At present ZTE has seven percent of 4G LTE basic patents among global telecommunications vendors. [Kuwait City, Kuwait, December 21, 2012]: Huawei, a leading global information and communications technology (ICT) solutions provider, and Zain, a pioneer in mobile telecommunications in eight markets across the Middle East and North Africa, today announced the successful launch of a commercial LTE 1800 MHz network that covers the entire country of Kuwait. The network is the largest of its kind in the region and marks a major step for the development of the region's mobile broadband market. Zain and Huawei expanded their LTE partnership after the successful deployment of GSM and UMTS networks in Kuwait. On November 21, Zain launched LTE services under the banner of "Wiyana Connect LTE", a newly-built LTE network that realizes Circuit Switched Fallback (CSFB) as a LTE voice solution and achieved download speeds exceeding 90 Mbps. The new LTE network also enables a wide variety of high-performance mobile applications and multimedia, including video conferencing, high-definition content transmissions, high-speed video downloads, and social networking platforms. These mobile services, made possible by both the existing GSM/UMTS and new LTE networks, provide Zain's subscribers with a superior mobile broadband experience. Zain has also partnered with Huawei to provide a diverse range of LTE smart devices, including smartphones, routers, hotspot MiFi, and dongles. The partnership includes agreements on a series of products, solutions, and services for terminal, radio access, and core network operations and management. Mr. Omar Al Omar, Zain Kuwait CEO, said: "We are building a world class mobile network in Kuwait with GSM, UMTS, and LTE access to offer our customers a significant improvement in network coverage and speed. We have selected Huawei as our long-term strategic partner and believe that their innovative solutions and extensive experience in launching commercial networks will enable our customers to enjoy an incomparable mobile broadband experience." Huawei has provided Zain with its cutting-edge SingleRAN solution that is capable of converging GSM, HSPA+, and LTE standards into a single network. This simplifies overall network structure while reducing Total Cost of Ownership (TCO) and expended manpower requirements. Huawei's SingleOSS suite also helps realize exceptional improvements in the operations and management efficiency of the whole network. "Our successful partnership with Zain for GSM, UMTS, and now LTE, demonstrates the effectiveness of Huawei's SingleRAN solution. The solution continues to help operators simultaneously manage the challenges of operating multiple networks while meeting growing mobile broadband demands," Said Mr. Ali Shi, President of Huawei Middle East Region. "We are committed to being the best business partner for our customers worldwide, and will remain focused on customer-centric innovation moving forward." In addition to the current LTE agreement, Zain Kuwait and Huawei have partnered on a number projects including a managed services agreement in 2011 where Huawei contributed to improvements in the cost, efficiency, and reliability of the operator's network. Today, Huawei continues to provide managed services to Zain Kuwait and has successfully increased the operator's network capacity, allowing it to accomodate many more users and services in the future. To date, Huawei has secured 130 commercial LTE/EPC contracts and has launched 56 commercial LTE networks with leading global operators, more than any other infrastructure provider. With a global business footprint in six continents, Huawei is driving LTE development and commercialization worldwide. Tele2 is the first operator in Europe successfully implemented voice over LTE (volte) test calls in Tele2 deployed Swedish LTE network. The talks in the IP-based LTE network showed a much better voice experience compared to 2G and 3G networks. The talks in the IP-based LTE network showed a much better voice experience compared to 2G and 3G networks. The Yankee Group's report notes that the Global Mobile Suppliers Association forecasts there will be 152 commercial LTE networks in 65 countries by the end of 2012, up from 47 networks at the end of 2011. As a result, Yankee predicts there will be 114 million active LTE connections globally by the end of 2013, increasing to 258 million by the end of 2014. The report came from wireless testing and measurement vendor Spirent Communications, which was acquired by Metrico Wireless in September. A 10 minute call used 680 milliwatts (mW) on CDMA an 1358 mW on VoLTE. Spirent estimated that on a full charge, and with all other data communications turned off, its test smartphone could deliver 502.6 minutes of talk time using CDMA, but only 251.8 minutes of talk time using VoLTE. Test network was not named, but it is MetroPCS for sure. LTE has been designed to operate in high-interference environments. The technology divides wide radio channels of 5 MHz or 10 MHz into tiny subcarriers of 15 kHz for actual transmission with the ability to selectively use just a subset of subcarriers at particular times. This makes it fundamentally different from previous CDMA technologies such as CDMA2000 and HSPA that employ wide radio channels of 1.25 MHz in the case of CDMA2000 and 5 MHz in HSPA. This use of subcarriers enables LTE to avoid frequencies on which there may be excessive interference. This core feature of LTE may enable the technology to support spectrum sharing, but don't get too excited that we have identified the silver bullet to the looming spectrum shortage. There are many caveats.